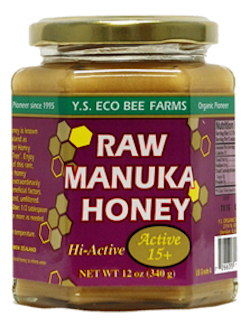 Manuka honey is known in New Zealand as "The Wonder Honey of the Tea Tree". Enjoy the purity of this rare, exotic, raw honey which has extraordinarily powerful beneficial factors. This Manuka honey is a superior, energy packed, raw honey with the highest possible levels of live enzymes, vitamins, minerals, antioxidants and beneficial agents as a functional whole food. Suggested use: Use 1/2 tablespoon twice daily or more as needed.